This move is aligned with Singapore’s ambition of being a world-class transport and logistics hub where innovation is critical for the industry, and our nation, to progress. Automated technologies like truck platooning which involves a human-driven lead truck leading a convoy of driverless trucks directly addresses the driver shortage problem. With connectivity that ensures better control of distance, speed and braking of trucks, this results in increased road safety for both road users and drivers. Moreover, truck platooning can save up to 10% of a truck’s fuel consumption and possibly 15% in the coming decade – translating this into potential cost savings for businesses. UD trucks Japan is currently hosting demonstrations for several of our autonomous drive trucks. Next year, we aim to roll out field tests and customer trials first in Japan and other markets in Asia upon successful trials. The All New Quon has already incorporated aspects of this technology with smart active safety systems. The Emergency Braking for Collision Warning and Advanced Emergency Braking System use high-precision radar that monitor the distance and speed of nearby vehicles real-time, ensuring the safety of drivers and other road users. Imagine increasing total deliveries where night time deliveries is an option with the use of electric trucks which are silent. And for the community, the added value of being zero-emission vehicles. The prevalence of electric trucks means that business owners can look forward to an increase in cost savings from zero fuel consumption. This will ensure healthier bottom lines. Moreover, quieter zero-emission vehicles also mean that drivers can do deliveries any time of the day to avoid traffic congestion, boosting overall business productivity and profitability. The move towards electric vehicles is already underway in Singapore with the launch of our nation’s first electric car sharing service and MOUs inked to develop driverless buses for public transport – the last of which involves Volvo Buses, our sister company. UD Trucks, part of Volvo Group, is already developing technologies necessary to create silent, zero-emission vehicles as part of our Innovation Roadmap. We are aiming for full-fledged commercialisation of both electric and automated trucks by 2030. .
Connectivity through digitalisation allows for real-time reporting as well as data analytics for constant improvements. 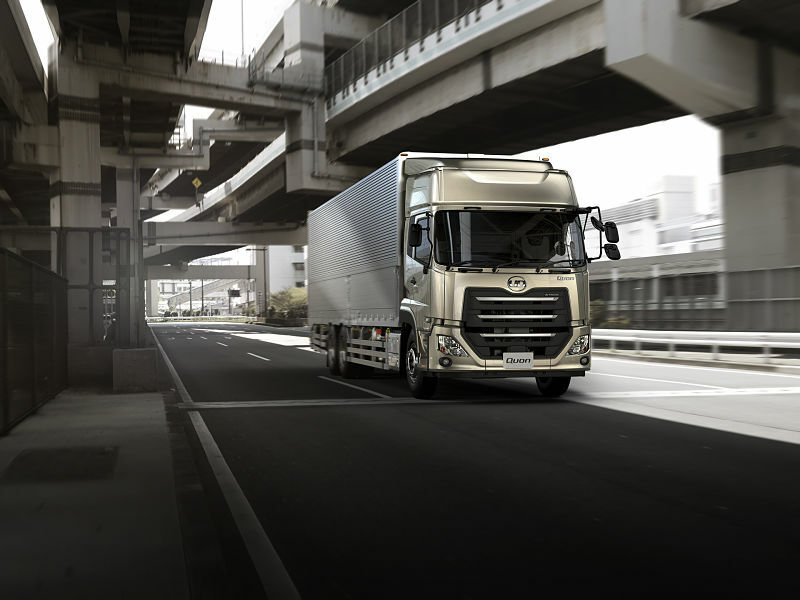 For example, UD Trucks in Japan has approximately 45,000 vehicles connected through the UD Information Service, which analyses data collected from each vehicle to help improve uptime and driving behaviour. Businesses also use this information to identify opportunities for driver training to boost their overall productivity levels, and limit fuel consumption in the way they drive. Robust data analytics also provides valuable insights that inform how UD Trucks constantly introduces even safer and more dependable trucks into the marketplace. A robust eco-system with the right infrastructure and regulations to encourage smart logistics to flourish will differentiate the global leaders and the followers. Initiatives such as setting up electric vehicle charging stations across the country will speed up adoption of such technologies, not just for trucking and logistics industry, but also for end consumers. In this respect, Singapore has the advantage of being a small city-state where setting up the infrastructure can be done speedily and effectively. Such concerted efforts will support Singapore’s ambition to cement our position not just as the leading logistics hub in the world, but one which supports environmental sustainability. Supply Chain Asia is a not-for-profit professional body that aims to bring professionals from within the logistics and supply chain industry together to share knowledge, learn from one another and create opportunities for collaborations.